I took The Partners down to the lake today. I didn’t expect I’d be able to let them go for a swim after all the rain – usually a rainstorm makes the lake pretty gungy for a few days. To my surprise, it was very clear, so it was their lucky day. Our Newfs love the water. I took them to a spot with a hill that runs down about 50 feet to a gravel beach, and I let them loose at the top of the hill. George and Ruby each let out a yelp and raced one another down the hill toward the beach. 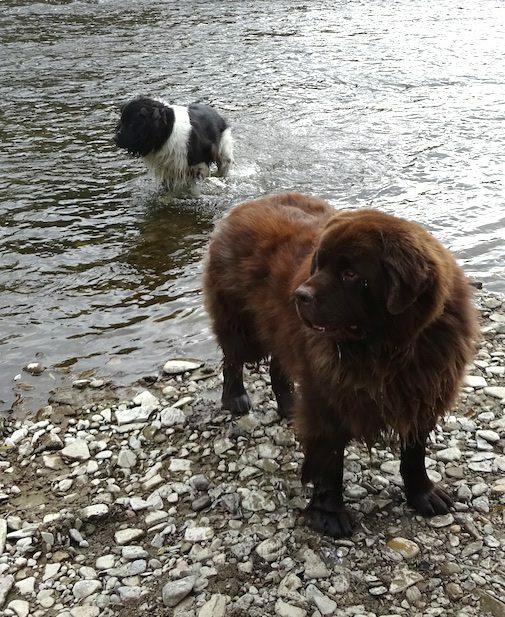 A pair of Newfs in a foot-race is a sight to behold. About halfway down, gravity got the better of George. If you haven’t met George before, he is 170 pounds of love. He couldn’t handle the incline at full-tilt-boogie Newf warp-drive and he stumbled, did half a face-plant, followed by a shoulder roll and by some miracle rolled himself back up to a standing position, as if he meant to do it. Then, regaining some dignity, George trotted the rest of the way to the water. By some miracle, he did not appear to have hurt himself. Now, many hours later, George still seems fine. No limp, no sign of pain anywhere. He and Ruby are settled down together right now, gnawing on chewies. Note to self: Newfs and gravity don’t mix. Georgie is a total sweetie…. He’s as big as I am.